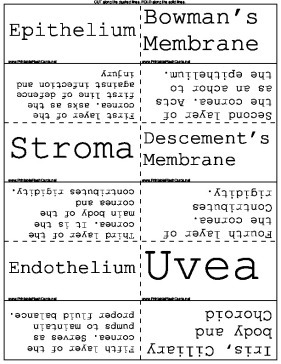 If you are studying to become an optometrist, you may find these vocabulary cards to be very useful. These cards cover the structure of the eye as well as many disorders involving the eyes. Bowman's Membrane Second layer of the cornea. Acts as an achor to the epithelium. Stroma Third layer of the cornea. It is the main body of the cornea and contributes rigidity. Descement's Membrane Fourth layer of the cornea. Contributes rigidity. Endothelium Fifth layer of the cornea. Serves as pumps to maintain proper fluid balance. Axial Length Length of the from front to back. Adnexa Orbit, Extra ocular muscles, eyelids, tear-producing and tear-draining lacrimal apparatus. Orbit Comprising 7 bones that house the globe, extra ocular muscles, blood vessels and nerves. Lateral Rectus Moves the outward toward the temple. Superior Rectus Moves the eye upward. Inferior Rectus Moves the eye downward. Superior Oblique Twists the eye down and in. Inferior Oblique Twists the eye up and out. Adduction The movement eye both eye turning in. Abduction The movement of both eyes turning out. Function of the eyelids Protect from injury, exclude light, and aid in the lubrication of the ocular surface. Palpebral Fissure The almond-shaped opening between the upper and lower lids. Trichiasis Eyelashes that grow inward and rub against the eye. Optical System Cornea, iris, pupil, crystalline lens, vitreous, retina and optic nerve. Binocular Vision Eyes are directed to a single target and are perfectly aligned. Fusion The blending of images from each eye so that the person perceives a single view. Tarsal Plate (Tarsus) A dense, plate-like framework, which gives the eyelids their firmness and shape. Orbicular Oculi A circular muscle that closes the eye when it contracts, as in winking. Levator Palpebrae Raises the upper lid when it contracts. Bulbar Conjunctiva A thin mucous membrane that lines the outer surface of the eyeball. Palpebral Conjunctiva A thin mucous membrane the line the inner surface of the eyelids. Punctum Tiny opening located on the upper and lower eyelid margin near the nose. Medial Canthus The point where the lids meet on the nasal side of the palpebral fissure. Lateral Canthus The point where the lids meet on the temporal side of the palpebral fissure. Fornix A loose pocket of conjunctival tissue in the area where the palpebral and bulbar conjunctiva meet beneath the lids. Lacrimal Apparatus Orbital structures that produce tears and the ducts that drain the excess fluid from the front of the eye. The three layers of the tear film Outer oily layer, middle aqueous layer and the innermost layer of mucinous (sticky) fluid. Meibomian Gland A row of tiny holes on the back margin of the eyelid that secretes the oily layer of the tear film. Lacrimal Gland Produces the aqueous layer of the tear film. Iris dilater muscle Contracts to dilate the pupil. Iris sphincter muscle. Contracts to make the pupil smaller. Function of the iris Controls the amount of light entering the eye. Function of the choroid Supplies nourishing blood to the outer layers of the retina. Anterior chamber Angle The junction of the cornea and the iris. Trabecular Meshwork Aspongy structure that filters the aqeous fluid and controls its rate of flow out of the eye. Canal of Schlemm A conduit in the sclera. Ophthalmologist A medical doctor, specializing in the prevention, diagnosis and medical as well as surgical treatment of vision and eye diseases. Optometrist Prescribe eyeglasses and contact lenses as well as detect eye disease. Orthoptist Test visual function, evaluate eye muscle disorders, and evaluating impairments in binocular vision such as double vision. Ocularist Fabricates and fits patients with prostheses. JCAHPO Joint Commission on Allied Health Personnel in Ophthalmology. Canaliculus Drains tears into the lacrimal sac. Limbus The junction between the sclera and the cornea. Anterior Chamber Small compartment between the cornea and the iris. Symptom Something the patient feels. Sign Changes observed by the physician. Ischemia A severe reduction of blood supply to any part of the body. Congentital Present from the time of birth. Proptosis (exophthalmos) Protruding eye ball. Edema Swelling from large amounts of fluid. Orbital Cellulitis Infection of tisuues in the orbit. Nystagmus The eye shifts involuntarly in a rhythmic beating motion. Keratitis Inflammation of the cornea. Vitreous A clear, jelly-like substance the nourishes the eye and gives it shape. Rods Night vision and Peripheral vision. Located in the periphery of the retina. Cones Sharp central Vision and color. Located in the macula. Ischemia Sever reduction in blood supply. Acute Inflammation that flares up quickly and remains for a short period of time. Chronic Inflammation that persists for a long period of time. Syndrome A set of signs and symptoms that is characteristics of a specific condition or disease. Ectropion Outward turning of the eyelid. Entropion Inward turning of the eyelid. Cataract Opacification of the lens. Presbyopia Inability to read due to age.